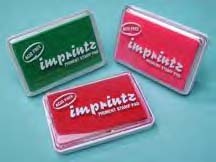 Stamp Ink Pad Colors may slightly vary from the color pictures shown. 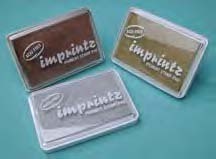 Pigment ink is great for Paper, Embossing Many Other Surfaces. Since it's also a crafting pigment ink it works on wood, fabrics and many other surfaces. Pigment will dry on paper without heating but we recommend a heat-set on things like wood, fabrics and non-porous surfaces. Heat-set if you want it to dry fast. Acid Free, archival and fade resistant. Waterproof for use with watercolors & markers. Dries permanently and quickly on most papers. Embosses detailed images with remarkable detail. Permanent on fabrics, wood, clay, and porous surfaces after heat-setting. Durable, raised pad surface inks all stamp sizes. Versatile, multi-surface and multi-purpose.